Affordable housing, skyscrapers, a bustling business center with big names, and a city vibe with bigger personality makes A-Town the place to be. 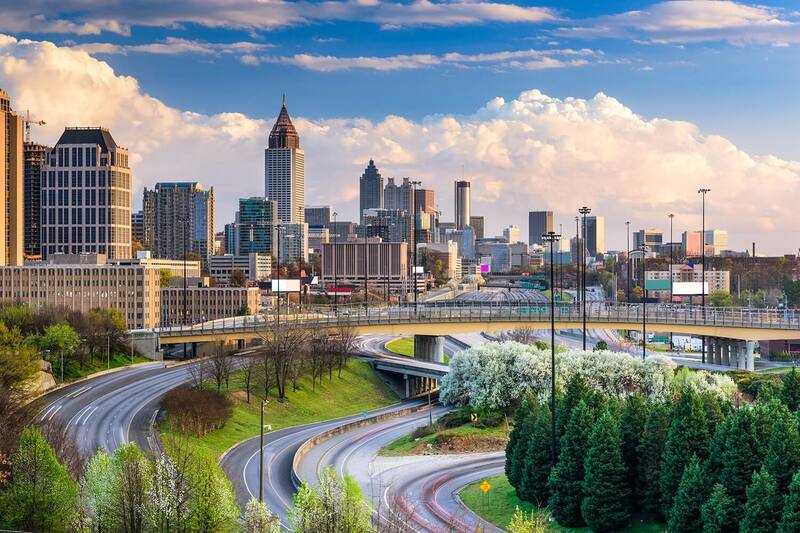 Atlanta, GA has about 4,515,000 residents. The top 3% of Atlanta’s 15,885 real estate agents can get houses off the market 1.5x faster than average and help sellers gain 6.6% on the list price. Need top Atlanta real estate agents who save buyers $43,189 more on average? HomeLight’s got your back. The top 3% of Atlanta’s 15,885 real estate agents sell 1.8x more homes than average agents do. They also get homes off the market 1.5x faster. Top agents save buyers as much as 11.4%, which is $43,189 more than average agents. Top agents help sellers make 6.6% more, which is $25,246 that you can put towards Atlanta Braves season tickets. Atlanta home sellers can make 103.7% of the list price when using a top Atlanta real estate agent. Average agents sell for around 97.1% of the list price, which breaks out to a $14,001 difference when compared to top agents. Average agents in Atlanta get buyers their dream place for 92.4% on the listing price, while top Atlanta real estate agents get properties for 81.1% of list on average. That is $72,030 saved with a top agent. The neighborhood of Garden Hills is full of winding streets lined with mature oak trees, beautiful evergreen parks and landscaped traffic islands. If you’re looking for world-class shopping and dining, take a quick walk over to nearby Buckhead Village. Homes in Garden Hills range from Georgian, Tudor and Spanish Revival to Craftsman. Often considered a tiny slice of New York, Midtown is the center of Atlanta’s arts scene. It is one of the city’s most pedestrian-friendly neighborhoods. The area also has easy access to MARTA and great bike lanes. The vibrant and diverse neighborhood is home to many award-winning performances, top restaurants, shops, art galleries and entertainers. Ormewood Park has become a popular neighborhood for Atlanta residents because of an increase in renovations and new housing stock. Although it’s a very family-friendly neighborhood, Ormewood Park maintains a diverse mix of age groups. In the past decade, new and larger homes have been developed in the area along Ormewood Avenue. HomeLight saved the day by identifying three best of class real estate agencies in Atlanta and within 2 months we purchased. When is the right time to hire a real estate agent in Atlanta? It's going to depend on the temperature of the Atlanta housing market but we generally recommend that you hire a real estate agent as soon as you're thinking of selling your home. Generally speaking, that's anywhere from 3 to 6 months prior to your desired move date. How important is it to hire a top real estate agent in Atlanta? On average, the top performing 5% of seller's agents generally command a higher selling price (+9%) than the average real estate agent. The top performing 5% of buyer's agents generally save their clients 2.5% more than the average real estate agent at closing. So, whether you're buying or selling your house, your odds of making more money on the transaction are higher if you work with a top performing agent. We encourage you to explore all of your options if you're selling a house in Atlanta, GA.
Why do I need to hire a licensed real estate agent in Atlanta? What is the average real estate agent commission for agents in Atlanta? While individual real estate agent commissions do vary, most real estate agents in Atlanta work for 6% of the home price. How do I find a real estate agent that specializes in a specific Atlanta neighborhood? What are the most important questions to ask when interviewing Atlanta neighborhood? We've put together a list of 24 questions to ask your real estate agent. Make sure to ask them of your Atlanta real estate agent during interviews. Why should I use HomeLight to find a Atlanta real estate agent? HomeLight analyzes all real estate agents in Atlanta to bring you custom, unbiased, data-driven recommendations. We use actual home sales transaction data to compare Atlanta real estate agents and will only introduce you to the top performing agents. Do these Atlanta real estate agents work for HomeLight? What factors does HomeLight consider when evaluating real estate agents in Atlanta?